"Fumée" (Smoke, 2008) in Paris in June, in a program curated to accompany the exhibition "Scrawl" at the Apexart Gallery in New York City. The Apexart program iwas reprised in its entirety at the Pocket Film Festival (June 11-14) in "New York Intime" program at the Forum des Images in Paris. 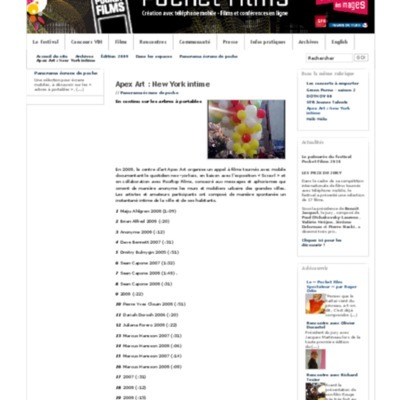 “"Fumée" in Apexart program in "New York Intime" at the Pocket Film Festival, Paris,” Pierre Yves Clouin, accessed April 23, 2019, http://pierreyvesclouin.fr/items/show/313.